Lloyd Gayton, 78, of Zebulon, joined Bass in the lawsuit���������. "Well, the ink wasn't dry on the settlement when they started doing it again," Gayton said. "So we sued again. And during the course of that suit, we asked the judge to listen to four of those tapes. After he listened to two, he told the commissioners, 'If you bring this before me I will find you in violation.' " ����������The commission settled a second time. Oftentimes in life, our paths cross with persons we never dreamed of in earlier times. In my efforts with AVOC, I became acquainted with Lloyd Gayton of Zebulon, known as the Pike Watchdog. We never met personally but would wind up on each other’s email lists and we exchanged emails on issues of Open Government from time to time. Lloyd attended many local government meetings and reported activities to citizens. When the Pike County Commissioners violated the Open Meetings Law, or were perceived to be in violation of the law, the Pikewatchdog reported it. He also joined in some lawsuits that changed the BOC’s methods of operation and helped expand the body of law and background on Open Government in Georgia. “He became ill around 2 weeks ago and was hospitalized first in Thomaston, and then transported to Macon. Doctors had a difficult time finding out what was wrong with him. At first they suspected pneumonia because he was having difficultly breathing. After running tests they determined that he had a staph infection (MRSA) in his lungs. Shortly after being hospitalized, Lloyd was placed on a respirator, and sedated. He was unconscious for most of the last few days of his life. Hopefully, another Pike citizen will come forward and monitor county government. Lloyd was actively involved in this year’s elections and some of his thoughts appear below. 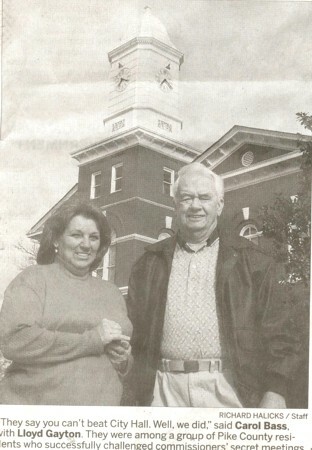 Lloyd Gayton and other “watchdogs” were recognized by the Atlanta Journal-Constitution in March 2006. Information on that article appears below. Many of us who strive for Open and Honest Government mourn the loss of Lloyd Gayton – The Pike Watchdog.He will be missed. GAYTON, Lloyd Mr. Lloyd Herman Gayton, age 80, of Concord, passed away October 16, 2008. He was born in Bartow County to the late Stovas and Pauline Gayton. He was a data processor for Lockheed in Marietta for a number of years. He tried to promote harmony among government officials in Pike County and was called the "Pike Watchdog". He was an avid golfer, enjoyed feeding and watching humming birds and following the whooping cranes. He was preceded in death by his first wife, Faye Gayton and his sister, Hazel Bryson. He is survived by his wife: Betty Ann Gayton; sons Lloyd Dennis Gayton of Marietta, Larry Dean Gayton of Concord and Richard Craig Gayton of Concord; Grandson: Edward Allen Wilson of Woodstock; Brothers and a sister-in-law: B. R. and Irene "Pond" Gayton of Covington and Charles Gayton of Douglasville; Sister-in-law and brother-in-law: Barbara and Ken Josey of MI; Numerous nieces and nephews also survive. A memorial service will be conducted on Monday, October 20 at 2 o'clock in the chapel of Moody Funeral Home with Rev. Michael Moody officiating. Interment will follow in Moody Memorial Gardens. Friends may visit the family on Monday from 12 to 2 p.m. at the funeral home. Moody Funeral Home, of Zebulon, GA, is in charge of arrangements (770) 567-8642. Zebulon --- Zebulon Pike, dubbed by a biographer as "the lost pathfinder," didn't pass through Georgia while en route to a certain peak. But folks here were so high on Pike that they created Pike County in 1822 and named its seat Zebulon. With its soaring clock tower, the stately courthouse in Zebulon is a landmark that even the stumbling explorer could locate, if he were around today. And if he couldn't, Carol Bass could show Pike the way. The courthouse is familiar terrain to her. But Bass might also feel some kinship with Pike. She sometimes thinks she's walking the same trail over and over again. "They say you can't beat City Hall. Well, we did," she said. "Then you gotta beat 'em again, and beat 'em again, and . . . ."
Bass and a small group of fellow residents filed suit against the County Commission in 2003, alleging that the commissioners were meeting in secret session in violation of the law. Their suit ended in a settlement, which included the unusual provision that the commission record all its executive sessions for two years and provide those records to the court on demand. Lloyd Gayton, 78, of Zebulon, joined Bass in the lawsuit. "Well, the ink wasn't dry on the settlement when they started doing it again," Gayton said. "So we sued again. And during the course of that suit, we asked the judge to listen to four of those tapes. After he listened to two, he told the commissioners, 'If you bring this before me I will find you in violation.' "
The commission settled a second time. I agree that the practice of routinely closing meetings should be stopped. I agree …….. that many of the Counties are now Closing Meetings. It is standard on their Agenda Notices for every meeting. Apparently, they have gotten some info or Law changes that encourage this. When I left office in Oconee at the end of 2000, this was not the case. New Commissioners are "Trained" by the Association of County Commissioners of GA (ACCG) and the Carl Vinson Institute of Govt at UGA (CVIOG). Citizens of Counties need to network on this and complain to Legislators about the trend - also to the Attorney General. The following article appeared recently in the Macon Telegraph. Many of you might not know that in the commission meeting held on Wednesday, February 13, ChairmanSteve Fry read a letter he had written to all Pike County employees. The letter was written because of the circumstances surrounding the suspension of Wendell Becker. I have attached a copy of that letter to this e-mail. This is my response to Fry’s letter. I have been questioned, criticized and even ridiculed for maintaining that the Pike County Commission Board broke the law when they hired James Bramblett in the commission meeting of April 24. Perhaps others are wondering why I feel that the hiring process was illegal; therefore, I will state the reasons for my position and let people decide for themselves. The following account is an example of how public officials, either through deliberate action or gross negligence, commit questionable and illegal acts. I have reported much of this to you previously and I bring it up again only to re-emphasize what some public officials will do to cover up something and that they have little or no regard for citizens they are supposed to serve. In early February 2008 County Manager Steve Marro wrongfully suspended Community Development Supervisor Wendell Becker for one week without pay. Another Community Development employee had a confrontation with Commissioner Roosevelt Willis and claimed that he created a hostile work environment…………………….. This is a good discussion of Executive Sessions that are routinely held by County Commissions in GA in recent years. At least some are being challenged. To be or not to be, that is the question! A variation of that applies to the Board of Commissioners’ executive sessions. To discuss or not to discuss, that is the question! What to discuss and what not to discuss in executive sessions has been a bone of contention for years and has been the subject of a couple of lawsuits against the county. During the BDA (Blount, Dunn and Avery) regime it became standard operating procedure to have “Executive Session—personnel” on the agendas. In the minds of BDA it meant they could discuss most anything they wished—and they did. It got so bad that a Superior Court judge, in a lawsuit settlement, slapped them on the wrists and ruled that executive sessions would be recorded for two (2) years. Apparently they didn’t think the judge was serious because nothing changed. ……………………………………. Later, in yet another lawsuit, evidence heard in depositions persuaded the same judge to listen to tapes of two executive sessions. After hearing part of one tape he decided he had heard enough and said that if the case were brought before him he would rule it a violation. That led to a settlement in the suit. If the Pike County Board of Commissioners reasonably expects to go into Executive Session for any purpose, the agenda shall so reflect in the example shown above.